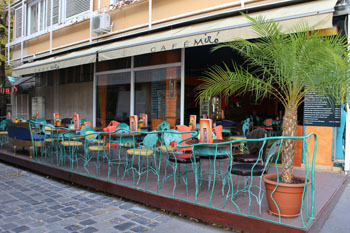 some good cafés and restaurants. It’s ideal to spend a romantic morning here in spring or on a sunny autumn day, before the tourists overrun the hill. If you can, time your visit to one of these events to make your experience of Budapest’s castle even more satisfying. 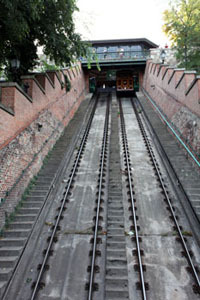 The best and most scenic way to get up to the hill is to take the funicular (Sikló) from Clark Ádám tér at the Buda end of the Chain Bridge. The track is almost 100 m long. Operating hours: 07.30 – 22.00 every day. It runs every 5-6 minutes during the day. A more romantic way of getting to the Castle is by taking the steps leading up the hill from Clark Adam Square. End your sightseeing in the Castle with wine tasting in a romantic stone cellar within the Hilton. The vaulted cellar is a part of the underground labyrinth system built by the castle inhabitants during the middle ages. English-speaking wine experts will introduce you to the wines and wine regions of Hungary. 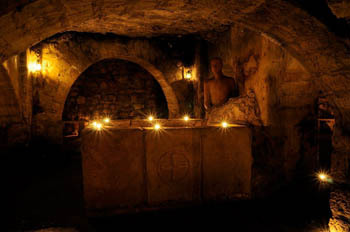 Find out more about the Faust Wine Cellar in Buda Castle! The first inhabitants moved up here in the 13th century after the devastating Mongol attacks. The Castle District’s Golden Age started when the Royal Court moved here. During the 15th century, under the rule of King Matthias, Buda became one of Europe’s most influential cities. The Turks invaded the Castle Hill in 1541 and ruled it until 1686 when the Austrian Habsburgs and their allied armies took back the hill. The siege left Castle District in ruins. After the Turks the Habsburgs moved here. Reconstructions began immediately, following the old street layout. The Castle became a government district. The current elegant Baroque appearance was formed by the mid 18th century. The battles in 1944-45 ruined the place again. 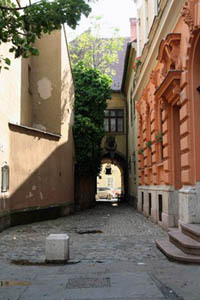 the street pattern of the medieval city has been kept and much of the architectural features have been restored. People still live here. Cars are banned from the area: only people who live or work there, guests of the Hilton Hotel, taxis and the Várbusz have permission to drive up. 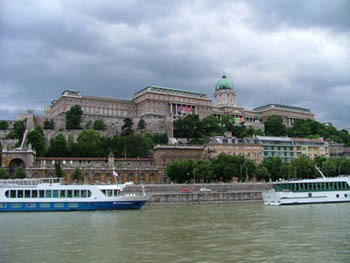 TIP: See also our map-based Buda Castle walking tour suggestions – easy to use itinerary with lots of photos. 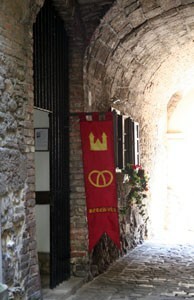 The only existing old town-gate. 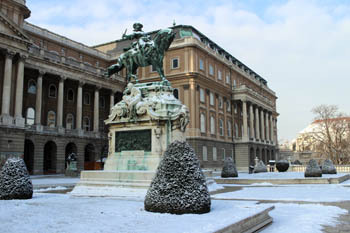 A very good spot to start your walk in Buda Castle. This is the northern gate of the District; all four roads that run along the hill converge here. From here it takes only a few minutes to get to busy Széll Kálmán tér. 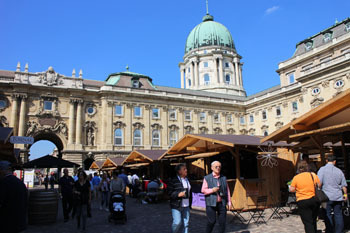 Bécsi kapu tér served as a Saturday Market in the middle ages for non-Jewish merchants. You can walk up to the top of the gate where you get a beautiful view of the Buda Hills. You can see the imposing Budapest Parliament from an unusual angle. 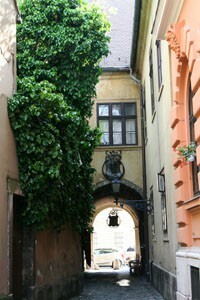 You’ll find some charming houses around Vienna Gate too (No.-s 5 – 7). The most famous is the house at No. 7. It was built on the site of a medieval house. A priest and teacher, who lived here, rebuilt it in 1807. Beautiful grilles decorate the windows and the door of a staircase in the gateway. In the first half of the 20th century Baron Lajos Hatvany lived here, a patron of arts. In 1935 and 1936 Thomas Mann was his guest in this house for three times. The large building of the National Archives towers the northern end of the square. The so-called Europe Grove is to the right of the Gate. Mayors of all the major European cities planted rare trees here in 1972. You’ll find about 16 types of trees here, for example Turkish hazel and Japanese cherry. On the corner of Kapisztrán tér and Országház utca, you bump into the Mary Magdalene Tower (Mária Magdolna Torony). It was a Franciscan church in medieval times. Under the Turkish rule this was the only Christian church; the Turks converted all the other churches into mosques. Since this was the only Christian church, both Catholics and Protestants used it. In the end, the Turks converted it into a mosque as well. 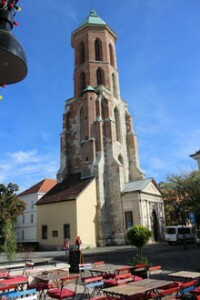 The church was destroyed in World War II, only its 15th century tower survived the bombings. The tower has been partly restored and opened as a museum to the public in May 2015. The Mary Magdalene tower and the terrrace of Spíler Biergarten on a bright autumn day. You can enjoy one of the best panoramic views from its top as well the greatest chime play of the country operating with 24 bells. On the ground floor a photo exhibit depicts the devastation of World War II and the 1956 revolution and the overall history of the church. Tickets to Mary Magdalene Tower: full price: 800 HUF, students (ages: 6-26), retirees (ages. 62-70): 400 HUF, families (2 adults + 1-4 kids): 1 600 HUF. Behind the Maria Magdalen Tower is the Military History Museum (Kapisztrán tér 2-4., Opening hours: Tue-Sun: 10.00-18.00). Visit the room devoted to the 1956 Uprising and you’ll find out everything important about these 13 chaotic days. The hand of the legendary Stalin Statue is here too. People destroyed the statue in the huge parking area behind Műcsarnok in Heroes’ Square during the uprising. A remarkable historical weapon collection, uniforms, flags and coins are also exhibited in this museum. 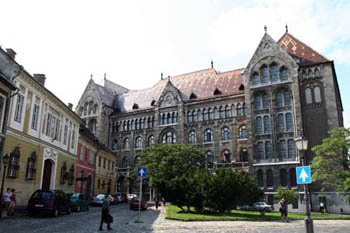 The centre of Budapest Castle District is at Szentháromság tér (Holy Trinity Square). The Holy Trinity Statue, the Old Town Hall, and Matthias Church are here. Ticket is valid to the church and to the museum. According to a legend, our first king St. Stephen started to build the church, but it hasn’t been proved yet. Historical proof shows that King Béla IV founded the church in 1255 after he moved his court up to Castle Hill from Óbuda. However, its name comes from the fact that the popular King Matthias held both of his weddings here. You can view Matthias’ small collection of religious treasures in the church museum. The interior is very striking. Despite the vaulting and the stained glass windows, it’s nothing like a Gothic cathedral; it has a sort of mystic, Eastern atmosphere. The wall paintings are scenes from the Bible and events from Hungary’s history. The church has excellent acoustics, so it often houses concerts. 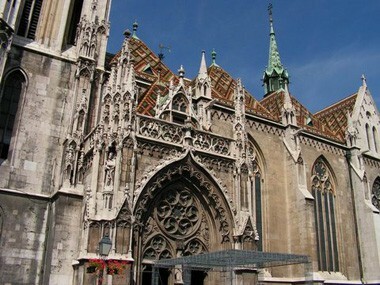 Matthias Church is probably the most popular place to get married in Budapest. The bell tower also functions as a lookout tower. You can climb up to its lower terrace at 47 m on 197 steps and enjoy the splendid view. The tower’s renovation was finished in 2015 and the lookout tower opened to the public in October 2015. Visiting hours: 10.00-17.00 every day, at every hour (max. 15 people can go up at once). Admission: full price: 1 400 HUF, students/retirees: 1 000 HUF, free for children under 6 years of age. Entry is free between 20.00-9.00, and between 16. October – 15. March. It is also free also free on public holidays. 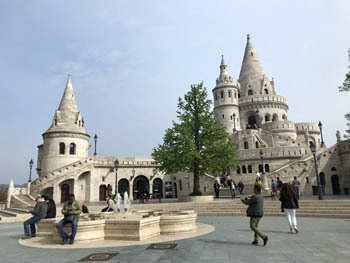 As part of the renovations of the castle, the neo-Roman Fishermen’s Bastion was added between 1895 and 1902. Despite the name it’s not part of a fortress and not even from the middle ages. 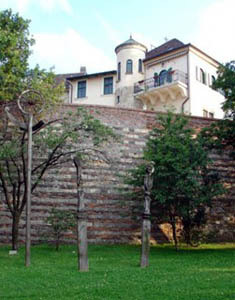 The bastion is a look-out terrace. It has seven turrets, one for each of the Hungarian tribes. There are two explanations about the origin of the Bastion’s name: some say a fish market was nearby in the Middle Ages, according to others, the Guild of Fishermen defended this part of the wall. The design – work of Frigyes Schulek – was inspired by the Far East. “Kitchs but beautiful” according to the writer Szerb Antal. From its top you get one of the city’s best panoramic views. 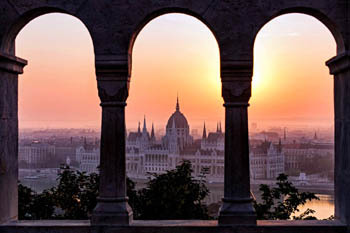 TIP: to enjoy the breathtaking view and a fine meal try the Halászbástya Restaurant. 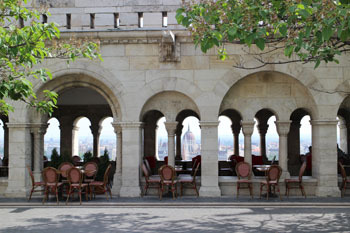 You can eat inside the Knight Hall or enjoy the panorama from one of the terraces (Margaréta Terrace, Halászbástya Terrace) (entrance is to the right of the Fishermen’s Bastion). The restaurant is open all the year round from 10.00 – 22.00. 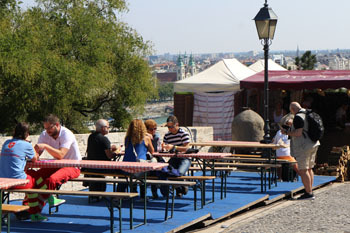 The Halászbástya Terrace of the restaurant is open from spring till autumn from 10.00 to 22.00. Prices are on the high side (soups: 1 400 – 2 200 HUF, main courses: 2 600-9 000 HUF). 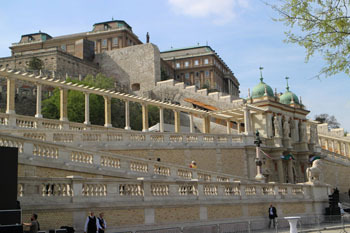 The terraces of the bastion offer one of the best panoramic spots of Budapest. To make the area even more romantic, beneath Budapest’s Castle Hill stretches a labyrinth of caves, tunnels and cellars. It’s about 10 km in length and a section of about 1.5 km is open to visitors. Part of the labyrinth was formed naturally; the other parts were excavated mostly in the Middle Ages for protection purposes. During World War II thousands lived through the siege down there. Medieval architecture – travel back in time under the ground to see the magnificent royal palace of King Sigismund of Luxembourg and King Matthias as well as monuments from the era of the Turkish rule. Dracula’s Chamber – The infamous count was imprisoned here by King Matthias for 12 eyars in the 25. century. Opera Panoptikum – The Masked Ball of the Black Count: a wax exhibition retelling a tale of another legendary figure, the Black Count. Nightime Tours with Lantern: start at 18.00. TIP: The temperature in the Labyrinth is around 14 – 15 Celsius and humidity is 90% so bring a coat or sweater with you! The original Royal Palace was destroyed and rebuilt many times. 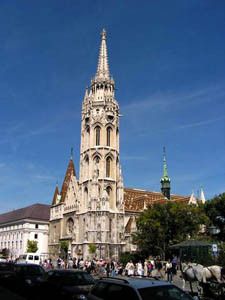 Its history is very much like that of the Matthias Church. King Béla IV.started building a palace in the 13th century after the Mongol invasion. The original Gothic Palace was built and expanded for 300 years. The golden era of the palace was under the rule of King Matthias (1451-90). It was totally destroyed in 1686 when the Habsburg army liberated Buda from the Turkish occupation. 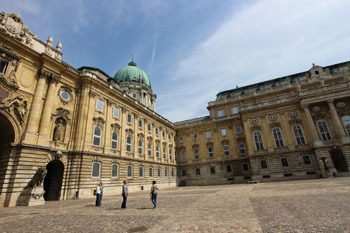 The Habsburgs built a completely new, small Baroque palace in the beginning of the 18th century. It was damaged again in the 1848-49 War of Independence. The following reconstruction almost doubled it in length at the end of the 19th century (now it’s 304 m long) and a large wing was attached to the back. 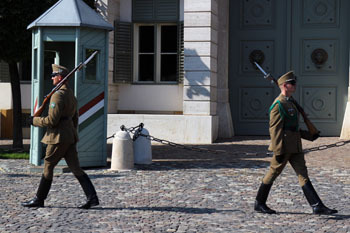 n 1945 it was the last defense of the German troops in Budapest. Post-war reconstruction revealed Gothic and Renaissance foundations that have been incorporated in the building during the works. Thus the Palace is a mix of architectural styles. 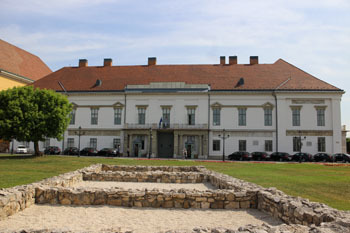 The white-coloured palace today houses the headquarters of the Hungarian President’s office. TIP: after or before exploring the castle, check out the newest, reconstructed landmark of our city, the Castle Bazaar & Royal Gardens at the southern side of the hill on the bank of the Danube. The historic complex is a work of Miklós Ybl architect and will function as a cultural and entertainment centre with exhibitions, shops and restaurants. A historic Jewish ritual bath (mikveh) dated back to the 13. century can also be visited at the Várkert. The English-language guided tours starting at 11.00 between Wednesday – Sunday are excellent opportunity to learn more about the past of Buda’s Jewish community. Date: usually in mid-July, Klezmer and gypsy music concerts in the Dominican court of the Hilton Hotel (Hess András tér 1-3.). Festival of Folk Arts the most renowned Hungarian folk artists and craftsmen from different regions of the country and abroad introduce their skills and craft work. Date: 05 – 08. September, 2019. The most prestigious of all wine festivals organized in Hungary is held Buda Castle in the first half of every September. As an alternative to the slightly boring Hilton, try Baltazár Hotel tucked away in a quieter part of the area in Országház utca. 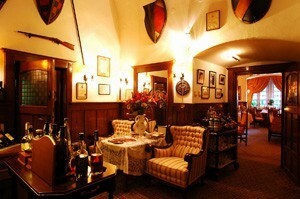 It is a charming boutique hotel with only 11 rooms and a fantastic restaurant with terrace. 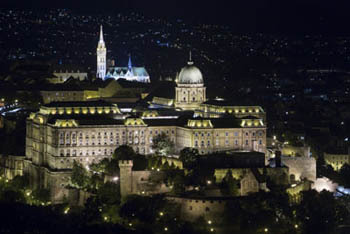 Where to Eat in Buda Castle? The newest member of the British celebrity chef’s Italian chain restaurant opened in the heart of the castle in May 2016. Jamie Oliver partnered with Hungarian restaurateur Zsidai Zoltán Roy (also by him: 21 Hungarian Restaurant at Fortuna utca 21., Cafe Pierrot at Fortuna utca 14., Baltazar Hotel at Országház utca 31., Pest Buda Bistro at Fortuna utca 3., – yes, looks like he owns all of Fortuna utca – Spíler Biergarten on Kapisztrán tér, ÉS Bisztró and ÉS Deli in Kempinski Hotel, Spíler Shanghai in Gozsdu Court). 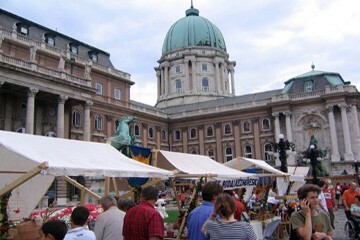 is present in the Hungarian place. A must-try for a tasty Italian-style lunch or dinner after exploring the historic monuments of the area. 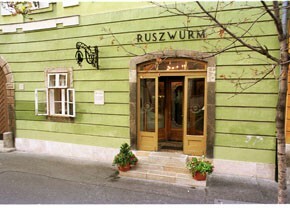 For a coffee and cake visit the city’s oldest confectionery, the Ruszwurm in Szentháromság utca. It’s a small, Baroque coffee house dating from 1824. Usually it’s crowded with tourists, but on a winter afternoon you might get a seat in its tiny salon. On a hot summer-day have an ice-cream. See other historic cafes in Budapest. This small bakery is in a narrow alley connecting Tárnok utca with Úri utca and specializes in strudels with various fillings (cottage cheese, cherry, apple etc.). We tried strudels of several other bakeries but Rétesvár’s are the most delicious. 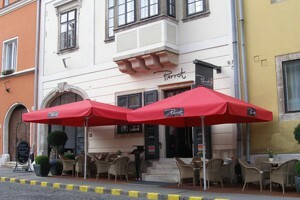 For something more substantial, your best bet is Café Pierrot in Fortuna utca. 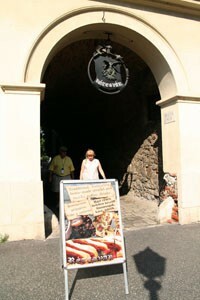 Besides Hungarian dishes you can choose from a variety of pastas and sandwiches. It has a free wireless internet access for its customers. 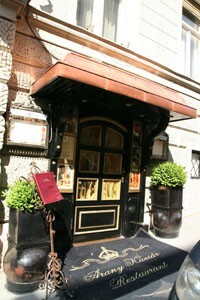 21 is an upscale Hungarian restaurant in Fortuna utca near Bécsi kapu tér. It received a BIB gourmand status from Michelin in 2010 for its quality cuisine at reasonable prices. According to their motto 21 Magyar offers “Hungarian cuisine as it used to be in the “good old days”, updated to the 21st century”. The wine list includes only Hungarian wines from the country’s best wineries (Tamás Günzer Villány, Tamás Dúzsi Szekszárd, Konyári Winery Balatonlelle, Otto Légli Balatonboglár, St. Andrea in Eger). Price guide: soups: cc. 1200-1300 HUF, main dishes: cc. 3 500-5 000. See more top-rated Restaurants offering Hungarian Dishes in Budapest. The menu of Arany Kaviár represents traditional Russian cuisine and the classical cuisine of the court of the Czars influenced by French cuisine. Guests can choose from the 5 course Tasting Menu, changed regularly, or the 8 course Gourmet Menu, both very popular. Apart from the menu, the restaurant pays special attention to the selection of wines and spirits, which are chosen by two sommeliers from famous Hungarian wine cellars and from among the masterpieces produced by smaller artisan wineries. Alabárdos is in a 400 year old gothic building in Országház utca (a small street opposite Matthias Church). The restaurant specializes in Hungarian cuisine but they’re open to new culinary trends. The wine list offers 70-80 different types of wine form Hungary’s various wine regions. Price guide: soups: cc. 1600 HUF, main dishes: cc. 3200-4900 HUF. For a modern world feeling try Café Miró in Úri utca, its surrealistic wrought iron furniture brings you back from the past. TIP: For more recommendations on where to go out eating see our Best Restaurant Guide.